I usually throw away kangkong (water spinach) stalks after taking off the leaves but I found out that it can be turned into a delicious spicy dish with coconut milk which is a perfect pair to fried tilapia (imagine salty crispy skin and soft, flaky meat..yum!) or any fish or grilled meat. Gising-gising according to what I found on the web got it’s name because it is spicy and will definitely wake up your senses..gising is a Tagalog word which means wake-up. 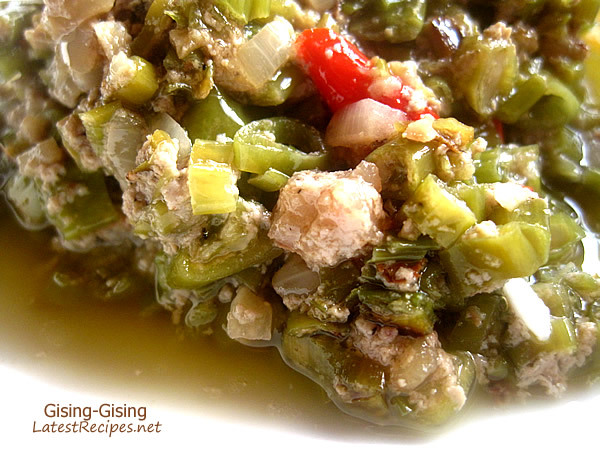 This dish is similar to laing and Bicol express (if you put lots of chilies in it and use minced or ground pork). You may use shrimp, pork or even dried fish (daing) in making this dish. It’s pretty simple to make even for those who are just learning how to cook and if you already know how to cook, it’s quite easy to figure out how to even without a recipe. If using meat or shrimp, add them next but take the shrimp off the pan when it turns pink and set it aside to be put back towards the end of cooking. When the ground pork has browned, add the kangkong, season with a little salt and pepper. Next, add green chilies and the coconut milk, add water if needed. Season with fish sauce, cover and let it simmer until coconut oil comes out or stop the cooking process when the veggies are done and you want to have more coconut milk sauce for the rice..mmmm! Pair it with fried tilapia or any fish and enjoy! What a great recipe – and fascinating background. Wake me up!